CUAT Conference, July 2018 – Our Trainers’ turn to be trained! 11th September 2018 - CUAT Conference, July 2018 – Our Trainers’ turn to be trained! In July, the Catch Up® Accredited Trainers (CUATs) got together to take part in their own training and be updated at our CUAT conference! 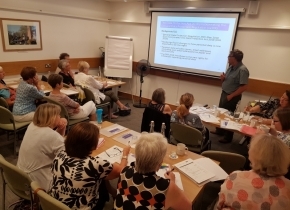 These conferences are organised twice a year for the trainers – this one taking place at our Catch Up® Regional Training Centre in Birmingham. The average response to the question, ‘How helpful has the conference been to you?’ was 4.9 (with 1 being ‘least helpful’ and 5 being ‘most helpful’)! Terrific news! Catch Up® CEO, Theresa Rogers, hosted the conference with other members of the team, with the aim of ensuring that all of the Accredited Trainers were fully updated with the exciting tools, resources and training packages available from Catch Up®! It also provided an excellent opportunity for the trainers to feed back on their experiences in the training rooms, share FAQs and offer some fantastic thoughts for the future. knowing that the training bundles are still available to book, allowing schools and other settings to build their Catch Up® teams! understanding that Catch Up® is fully compliant with the new Data Protection Legislation – and receiving training to ensure that our CUATs are too! hearing how well the accreditation system is running, with lots of trainees submitting for the qualification and achieving great success! hearing how the office team have continued with their own CPD! We also said a very sad farewell to three of our Accredited Trainers. Janet, Catherine and Jan have been part of the Catch Up® family for many years, and have ensured that trainees have felt inspired and motivated to make a difference. We will miss them greatly, but wish them all the best for the future.